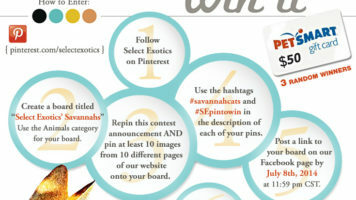 Calling all Select Exotics Savannah owners! 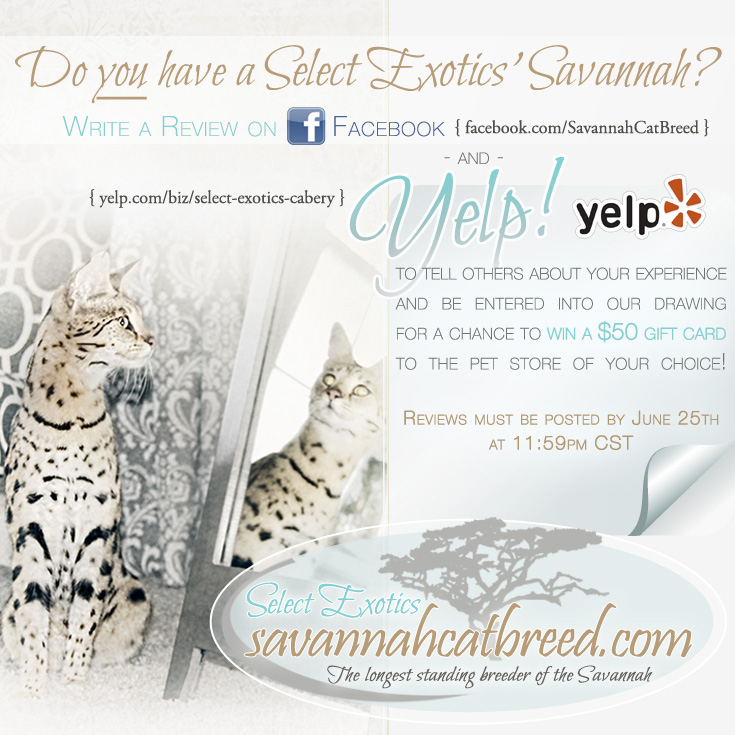 We are holding a drawing for all those who post Select Exotic’s reviews on our Facebook page (facebook.com/SavannahCatBreed) and Yelp listing (yelp.com/biz/select-exotics-cabery) between now and June 25th at 11:59 pm CST. Tell us about your experience, both with us at Select Exotics, as well as your Savannah and all of its coolness! On Thursday, June 26th we will enter all participants into a drawing and the lucky winner will receive a $50 gift card to the pet store of their choice. The winner will be announced on our Facebook page. After researching SV breeders for a number of months I decided to purchase an F1 from Select Exotics for a combination of reasons. Not only did I wanted a type-y savannah, one that was exotic & wild looking, but the gentle temperament I had heard about. It was also important to me that the kitten come from an environment where the kittens were socialized in a home-setting, not a kennel or cattery. Many breeders claim to be all those things, but their websites and communications (emails, once they realized I was a serious buyer) were lacking in truly explaining how they run their breeding operations as well as conduct the business side of things. Select Exotics’ website is very open & transparent. They explained in detail about their breeding program with great photos of their queens & kings and resulting kittens. They also provided information about their staff including the qualifications and experience of each. I could see this was a professionally run business with highly qualified people who truly were passionate about their cats. It was a pleasure doing business with Select Exotics and to adopt my F1 from such a quality breeder. My Loki is intelligent, funny, a sweetheart and has been everything I wanted! When it came time to get Loki a companion I returned to Select Exotics for an F2 and found Dexter, one of their Elite kittens. He is amazing and, like Loki, is stunning to look at with a darling personality. The boys have bonded beautifully and are a delight to behold! Upon meeting Loki & Dex my friends marvel first at their unique appearance and then at their calm demeanor, intelligence and creative antics. They’ve become minor celebrities in my social circles!